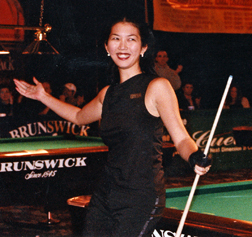 The 1999 WPBA Gentleman Jack Dallas Shootout was neither the most prestigious nor lucrative title Jeanette Lee ever won. But it is definitely one the most memorable for the Black Widow. On the final day of the tournament, Lee won four matches while struggling with paralyzing back spasms that almost forced her to forfeit. Diagnosed with scoliosis as a child, she underwent numerous surgeries to help ease the discomfort caused by the disease. But in Dallas, she had no remedy for the pain. She somehow managed to beat Line Kjoersvik, Gerda Hofstatter and Allison Fisher to make it to the finals. All the while, Lee stuck to the mantra, "Just hang on, just hang on." Lee was just relieved to end the agony. In the final, Lee faced WPBA newcomer Karen Corr, who promptly took the first four racks in the race-to-11 set. Lee then took seven straight games, while forced to walk away from the table three times in obvious pain. At one point, a fan had to help her pour a glass of water and get settled in her chair. "The pain was telling me to forfeit," she said. "My back was screaming." Corr fought back to tie the match at 7-7, but Lee managed to climb on the hill, 10-8. With ball-in-hand after Corr scratched on the break, Lee gently worked her way to a 4-9 combination. "Please let me make this ball," she said as she lined up the title clincher. She dropped the 9, then buried her face in her hands and cried. Throughout the day, the boisterous Dallas crowd reached its highest decibel level when Lee needed a boost of energy. "I just didn't give up," Lee said. "I just couldn't do it [without] all these people." For one of the most accomplished players in WPBA history, the true significance might just have been what she proved to herself. "This is one of the most important wins in my career," she said.